As I have been prepping for my first day back to work tomorrow I have tried to get myself back in the mindset of thinking through all our meals on Sundays. I forget how this can be a lot of work up front but how much easier it is as the week goes on and you have things prepped and ready for the meal ahead of time. I wanted to share two meals I made this week that were delicious. If you are able to roast the vegetables ahead of time then the actual prep of these delicious meals is simple. First up was a variation of my favorite barley risotto. Instead of mushrooms and sausage this time I did butternut squash, kale and turkey sausage (this would be just as good without the meat as well). I love anything with roasted vegetables and have always loved roasted vegetable sandwiches so decided to try it in quesadilla format. I added pesto and goat cheese to make it complete. As I said I highly recommend roasting the vegetables for both of these recipes at the same time. Then when it comes time to make the meals it’s fast. Plus, after the vegetables are roasted the risotto only uses one pot (MY FAVORITE) and all I had to do to make the quesadillas the next night was assemble and bake. After roasting store the squash separate from the other vegetables (the mushrooms, zucchini, onions and red peppers can go in the same container). Below is one of the two pans of veggies I did (the other had the onion, red pepper and second zucchini). This step can be done in advance. 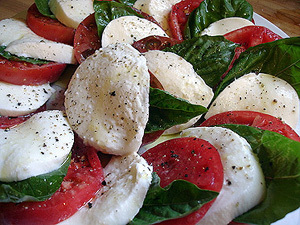 Spray a baking sheet with cooking spray then lay vegetables on top and drizzle olive oil over them. Roast at 400 for 40 minutes or until tender. If making the quesadillas later in the week store the vegetables in a sealed container in the fridge overnight. Assemble quesadillas by laying four tortillas down and spreading the vegetables evenly over them. Next, break off small chunks of goat cheese and spread on top of the vegetables. On the other 4 tortillas spread 1/4 cup of pesto evenly to the edges. Flip this quesadilla on top of the other tortilla. Lay all four assembled quesadillas on a baking sheet and bake for 5-10 minutes (until tortilla is slightly browned), flip and bake 5-10 min on the other side. This step can be done a day ahead if desired. Spray a baking pan with cooking spray then place the diced squash on the pan and drizzle with 1 Tbsp olive oil. Roast the butternut squash at 400 for 40 minutes. Heat dutch oven (or a large pot) to medium high and add 1 Tbsp olive oil. Saute the onion and sausage until sausage is cooked through. When 10 minutes remain (after barley has been on for 30 minutes) add the kale and roasted butternut squash. Remove from heat. Add the Parmesan cheese. Click here to see how long to boil eggs for different consistencies of yolk if you want to add an egg to the top. If doing that start the eggs when you begin the recipe. In a large saucepan, add oil and heat up. Then add minced onion, garlic, ginger and vegetables (carrots, mushrooms and broccoli or any variation of vegetables you want added). Continually toss and cook for 3-5 minutes on medium heat. Next add in broth and water. Add Chinese noodles and celery seed. Boil for amount of time listed on Chinese noodle direction for noodles to be done. 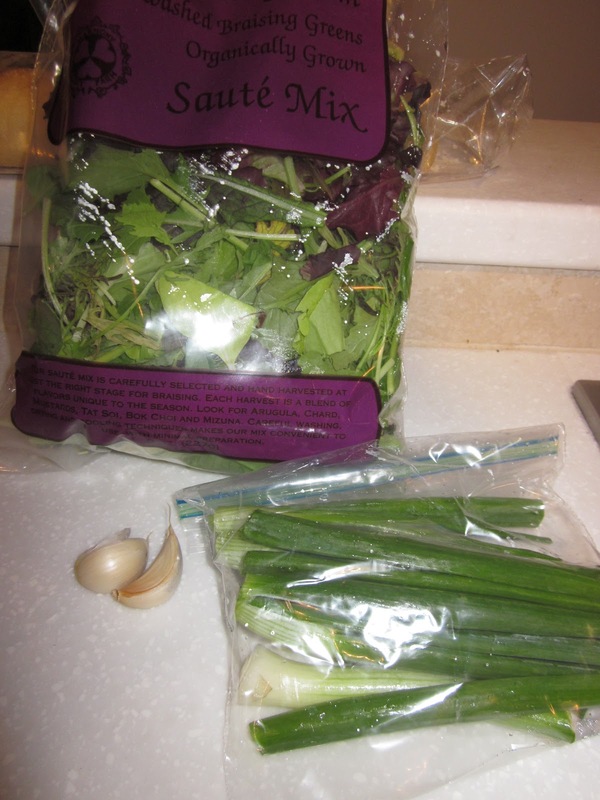 Remove from heat and top with chives and any additional optional toppings you want. I find it ironic that within this big world wide web I searched how to make Sweet Potato Oatmeal pancakes on pinterest and got linked to a blog that was inspired by the same restaurant as I was. The restaurant that impressed me (and them) with these delicious pancakes was Short Stack Eatery in Madison. After eating my sweet potato oatmeal pancakes I couldn’t wait to make them for the kids (and who am I kidding for myself). Just as anticipated all the kids loved them. My four year old ate 3, the two year old 2 and the baby 1 and they have now been added into our breakfast for dinner rotation. We served them with fresh cut up fruit on the side and milk. Since sweet potatoes are a fall food staple it’s the perfect time to try these out. You will need 1-2 sweet potatoes from your potato sack + some staple fall spices (nutmeg and cinnamon). I recommend cooking the sweet potatoes ahead of time so they are cooled and easier to peel and mash when you are ready to make the batter. Also, they freeze well so consider doubling it and freezing them to microwave later. I do this for as one of my quick healthy options for our 8 month old. My last editors note. The restaurant served them with mascarpone cream, which I listed the ingredients and directions for below but haven’t done so myself as I wasn’t eating dairy. Although, now that I can have dairy again I can’t wait to try it. Optional: Serve with mascarpone cream (the restaurant did this as well as the blogger who posted the recipe) and fresh fruit (raspberries, strawberries, peaches or blueberries). Cook Sweet Potatoes. I usually do mine in the microwave. Prick the potatoes a few times with a fork, place on a plate and microwave on high 8-10 minutes or until tender when fork is inserted. Take out and let cool (if making the pancakes later then put in a covered container in the fridge. When ready to make the pancakes peel the cooled off sweet potatoes and mash. In a large bowl, mix together all the dry ingredients from flour through sugar. In a separate medium bowl, whisk together the milk, yogurt, melted butter, egg and egg white. Pour the wet ingredients into the dry ingredients and mix until combined. Stir in mashed sweet potatoes and mix until there are no clumps. Heat a griddle or fry pan over medium heat and spray with PAM or add butter to pan. Pour ~1/4 cup of batter for each pancake and cook for 1.5-2 minutes, flip and repeat. If making the mascarpone cream sauce, whisk the whipping cream in blender until it firm peaks form. Add sugar and vanilla extract and mix until combined. My dinner tonight was a last minute meal inspired by our morning trip to the Shorewood Farmers Market. I ran into my friend Rachel who told me about this delicious squash lasagna she made earlier in the week. After my mouth was watering my husband set out to find some squash at the market and I made my grocery list of other things we’d need. My friend, like me, often gets inspiration from a recipe then whips it up in her own way based on what she has and how she likes. I got some inspiration from pinterest variations of this but ended up doing my own simpler thing so I thought I’d write it down so I could make it again. I also had to share this as I can’t wait to eat the leftovers tomorrow. Another friend of mine prepped a similar bake tonight for a dinner early this week which made me realize it’s a great dish to pre-prepare and pop in after work on a crisp fall day. In the meantime heat 1 Tbsp olive oil in a medium saucepan. Add onion and let cook 3-5 minutes then add the sausage, breaking up pieces and cook until the meat is brown and cooked through. Turn heat to low and add 1/2 container of marinara sauce, let simmer until squash is done. Mix together the ricotta cheese, parmesan cheese and parsley and set aside. Once the squash is done let it cool 10 minutes. Keep the oven on. Then using a fork scoop out the inside of the squash into a greased 8×8 casserole dish. It will come out looking like spaghetti noodles. I personally mashed mine a little with a fork in the dish. Once the squash is set layer it with the meat sauce and then spread the ricotto cheese mixture on top. Place the dish back in the oven for 25-30 minutes until the sides bubble a little. If you are making the dish ahead then skip this part until you are ready to eat and place in the refrigerator. I would suggest cooking the day after it’s prepped. My daughter asked me this weekend if we could have soft pretzels like we had on the ferry from Wisconsin to Michigan last summer. I love that, like me, the things she remembers about trips include the food she ate! Ironically, I looked at my kids food ideas board on pinterest and saw that I had already pinned a soft pretzel recipe. Milwaukee has a plethora of German brew pubs, which means tons of homemade soft pretzels, and a new family favorite appetizer. Monday was my first afternoon alone with all three kiddos. Miles was napping in the swing and the girls were playing great together downstairs so I figured I’d bake. Why not? While the pretzels were baking I made a honey mustard dip and I put some Tostados queso dip in a second bowl as our two dipping sauces (Yes…dietitians have processed food in their houses too. Remember -MODERATION). I felt so accomplished afterwards. A fun, delicious homemade dinner on the table that everyone loved. Ryan and I had ours with an Italian sausage and salad on the side to round out the meal and the kids had deli meat and fruit with theirs. One quick disclaimer. This is a very easy recipe but beware that it is a little time consuming as you have to make the dough, knead the dough (I did this in my Kitchen Aid mixer), let the dough rise for 15 minutes, form pretzels, let the pretzels sit in baking soda bath for 2 minute and then bake them for 8 minutes. I did 2-3 pretzels in the baking soda bath at a time to speed things up. I’d assume ~45 minutes total before they are ready to eat but I promise it is worth it. Combine yeast and warm water and sugar in a stand mixer fitted with a hook or in a bowl if you aren’t using a mixer. Let sit until your yeast is “frosty” or looks like it’s bubbling. Add flour one cup at a time until dough forms and is no longer sticky. You may need more or less based on temperatures where you live. I found that I actually had to add 3 tsp of water (one at a time) to this to make it sticky. Once dough Knead dough in mixer or by hand for 5 minutes until its smooth. While dough rises prepare baking soda bath. Boil 2 cups of water with 4 Tbsp baking soda. Stir and heat until dissolved. Remove from heat and pour into a 8×8 or 9×9 pan and let cool to be lukewarm temperatures. Once 2-3 are made place them in the baking soda bath and leave for 2 minutes (make the rest of the pretzels while they soak). If they are not fully covered spoon liquid mixture on to the top. My mother in law made a delicious herbed tomato and roasted garlic tart from Smitten Kitchen when she was in town this fall so we had extra puff pastry sheets in our freezer. I spotted them on the perfect day when the kids were happily playing together by themselves in the tent where I could see them. This meant I had time to think about a way to use them that we would all enjoy for lunch. Our littlest, Luisa, loves eggs so the breakfast puff pastry concept was launched. The nice thing about these little egg tarts is you can make them anyway you want. We had breakfast sausage and spinach around to add but you could do any cooked or roasted vegetable with or without a meat (see the bottom of this post for my combination ideas). I also was able to take mine out earlier so my egg was over medium while Elena and Luisa’s yolks were cracked and fully cooked. Individualized shared meal ideas are some of my favorite go-to meals mostly when they are quick like this was. They got a big stamp of approval from Luisa who ate hers in record time. I doctored mine up with Trader Joe’s Sambal Matah Indonesian salsa for added flavor and spice. Another salsa that would be good to top them with is Frotera’s Chipotle Salsa made with roasted tomatillo and garlic for a smoky fresh spice flavor (my new favorite obsession). These were so good and fun for the kids that I’ll be making different variations for Luisa’s first birthday dinner and serving them with a side of fresh fruit, salad and cake. Unfold the pastry sheets on a lightly floured surface and cut them into four pieces. Do you ever get stressed about magazines piling up month after month? Not real stresssed more just “anxious to read them and not see the next months edition show up before you have even lifted the cover of the previous months” stressed. Personally, I feel like this a lot lately as life is busy and those lay back read a magazine days have become far and few. I finally had a quiet sleeping baby and a chance to catch up on my celebrity gossip from US Weekly, learn from my Parenting magazine, get recipe ideas from Cooking Light and Todays Dietitian. While skimming Todays Dietitian I came across this great and easy vegetarian dish in their Meatless Mondays article. So three weeks ago I cooked it up for my in-laws (aka MN mom and dad) and meat loving husband and it got passing reviews from all three. To my surprise the second time I made it our almost 2 year old tolerated the mildly spiced sauce and loved it. This has already become a dish in our frequent rotation and will be a great go to last minute week night meal for our house. 2. The veggies and noodles cook in the same pot so you only end up with three dirty dishes (a bowl for the sauce, one pot and a strainer)…yes THREE dishes TOTAL! Amazing. 3. It was EXTREMELY easy and the sauce used things that I normally have in my pantry (if you don’t have almond butter you could definitely sub peanut butter). We ate it three weeks ago and I have made it by request two more times since then which rarely happens. Once for my dad and the next time for a group of 8 (we doubled the recipe that time). There is a little kick so if you are sensitive to spice you may want to add the chili-garlic sauce after but it truly was a mild kick and our daughter was fine with it. Here is the recipe with my adjustments/comments italicized. I do mention below that I normally double the sauce (when I doubled the recipe I just did 1.5 times the sauce) so if you plan to do that you will need double the amount of soy sauce, lime juice, brown sugar and chili-garlic sauce then what is listed below. 4. I DOUBLED THE QUANTITIES ABOVE WHEN I MADE THE SAUCE — While the pasta is cooking, make the sauce. Place the almond butter, soy sauce, lime juice, brown sugar, chili-garlic sauce, and 3 T of boiling water from the pasta pot into a large bowl, and whisk until smooth. 5. Drain the noodles and vegetables, return them to the pasta pot, add the sauce and toss to coat. Serve garnished with the toasted almonds and scallion greens (if the sauce turns out thick, as mine sometimes does, just add a little more water to the finished pot and mix in). — Recipe Adapted from Ellie Krieger, RD, for the Almond Board of California. My husband and I love sauces, spreads and things with a kick. Now that it’s basil season that means lots of pesto. Pesto chicken paninis, pasta, sandwiches, salad dressings…you get my drift. We love pesto!! When we were up north over the fourth of July I saw a recipe for a spicy pesto that caught my eye. We made it last week and I can’t wait to make it again this week. It was AMAZING. I know I say that a lot but this truly was to die for. We ate it everyday until it was gone. Day one was grilled chicken with the pesto on top, day two paninis with pesto, day three grilled chicken club sandwiches with pesto. I even found myself sneaking in the kitchen to dip pretzels in it during the day. If you like a little spice you will love this recipe (I think I may even try a little jalapeno in it next time too to kick it up another notch). They said you can store it in your refrigerator for up to three weeks but believe me it will be long gone before you have to worry about the expiration date. I can’t wait to try it on pasta and grilled fish!! 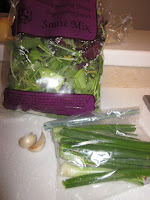 Place mixture in a jar or storable container and pour in olive oil and stir. How do you say thanks to a dear friend who graciously created your website for you. Well, for me the answer was easy, have her over for dinner. While she’s the website and design expert, I can be the dinner chef. Kristen has been an amazing friend to me over the years. We grew up in Racine together and became closer as we got older and am so blessed that she lives in the Twin Cities with me. She’s an amazing freelance web designer and developer among many other thing (card player, friend, listener, happy hour mate, pedal pub participant, etc…). The past two months in her small window of free time she has taken on the task of upgrading me from my blog into a website, which would have taken me over a year with many flip out tantrums. I highly recommend checking out her website to see some of her work and get more information. I also encourage all my readers to browse the new site to see all the new and improved upgrades! Ever since Ryan and I had a date night at Mill Valley Kitchen I’ve been craving their wild mushroom farro risotto. Since, Kristen’s a vegetarian and a fellow mushroom lover it seemed like the perfect time to try this out on my own and low and behold my favorite source, Cooking Light, had a recipe. I ventured to Whole Foods as I knew they would have some of the more obscure ingredients like mushroom broth. I also found they have an array of dried mushrooms to choose from. After much debate I went with shiitake, partially because I wasn’t familiar with some of the varieties and partially because I love shiitake mushrooms. I must forewarn all readers who plan to make this that soaking them in boiling water as the recipe states, did give a rather unpleasant smell, but know that it’s subtle and worth it as they gave a delicious flavor in the dish. Another tip to readers. Farro, like most grains should be soaked before using. This is important to help rinse the grain and also, to politely say this, make it “more comfortable” to digest. Mine only soaked for 2 hours since I was making the dish the same night I bought the farro. If you know you are going to make it in advance I recommend soaking the farro overnight. To finish our meal I paired our risotto with a salad of mixed greens, dried cherries, avocado, feta and poppyseed dressing then we finished our meal with a mini cheesecake and cannoli from Whole Foods. This was the perfect meal to make while Kristen was hard at work since it called for 30-40 minutes of stirring. It gave her time to do her web designing while I stayed out of the way. Our overall consensus was a double thumbs up on to the dish. I would definitely make it again for any risotto or mushroom lover or vegetarian foodie and Kristen anytime you’re craving it again you knows who to call. Once again, a huge thank you to my dear friend Kristen Angel for all her amazing work on the site. I hope you enjoy the new look and upgraded features. Let us know what you think! If you’re saying to yourself, why cheese? Well, for one, the packers are on a nice winning streak and I’m a proud cheese head and two, because the holidays make me think of delicious cheese dishes and plates. I started my food of the month off a few days behind but with a great entrance. This was a great dish for a Sunday afternoon. I made mine with Trader Joe’s organic vegetable radiatore noodles and I split my milk (1/2 skim milk and 1/2 2% lactaid milk). I also used a gruyere/swiss mix instead of straight gruyere cheese and it was delicious. Also, I only had whole wheat bread so I used this to make the bread crumbs. Lastly, and this was my mistake, I added 3/4 Tbsp instead of 1/2 tsp of nutmeg but we all liked it. I think I would do a 1/2 Tbsp if I made it again. From a nutrition standpoint for macaroni and cheese I would classify this one in the middle. It’s not a low fat recipe but it also isn’t an insane recipe with cream and extra pounds of cheese. You could always cut back on how much cheese you add if you want to lighten it up even more. I found it to be a nice balance that can be paired with some veggies or a side salad to round out the meal. To make this healthier I always use fat free cream cheese. You mix the cream cheese with garlic so it will still have a good flavor. I opt out of adding the pistachios since I’m not a big fan of them but I know others who have made this with them. I’ve brought this to a work party, friends party and made it for family and everyone loves it. Plus you can make it the day ahead and it’s Christmas colors. Another thing to note is some cheese are a little lower in fat than others. For example, feta, provolone, mozzarella and swiss cheese have less natural fat than cheddar and havarti cheese. Another great cheese is Laughing Cow, who make a great portioned swiss cheese with 50 calories per wedge plus a light version that comes in multiple flavors for only 35 calories per wedge. It is a great substitution for cream cheese or to spread on sandwiches. Another way to cut back on the fat in cheese is to choose ones made with 2% milk. They will have less fat without sacrificing taste and texture like some fat free cheeses do.